I have read a few novels by Juliette Fay and I have always appreciated how well she portrays family life. Somehow she has a talent for creating very real and memorable characters that get under your skin (in a good way!) She has done it once again in her latest novel THE SHORTEST WAY HOME. I really, really liked this book. THE SHORTEST WAY HOME tells the story of Sean, a man who has spent his entire adult life serving as a nurse in Third World war zones. While his career is nothing short of noble, Sean's motivations for this profession are largely because he has been running from his past, namely his family. When he decides it's time to come back home, Sean finds that his family is facing their own set of problems. His elderly aunt who took care of Sean and his siblings is having issues with her memory, his sister wants to leave to pursue her acting career, and his nephew has troubles with social situations. Thankfully, Sean finds comfort in some friends (and even a girlfriend) from his past; and he is forced to re-examine his own life, his responsibilities, and his happiness. It only took me a few pages to become utterly absorbed in Sean and his family's life. Basically, I started this book and pretty much read it every free minute I had for the next day or so -- I couldn't put it down! As was the case with Ms. Fay's other novels, I loved how real the characters were, both their strengths and their flaws; and I just cared so much about their stories. What I also appreciated is that I didn't always "love" the characters or their actions, but I did "love" that they evolved throughout the course of the story. I think one of the best things about THE SHORTEST WAY HOME is how it made me feel. I actually found myself relating to the story despite having almost nothing in common with the main characters. I know that's a testament to Ms. Fay's writing and character development. She manages to create very realistic characters while at the same time writing interesting stories for them. And in the case of THE SHORTEST WAY HOME, she gave these characters some pretty heavy issues including the possibility of inheriting a deadly disease, dementia, infertility, sensory issues and/or autism, and more. However, I think it's the day-to-day lives of these characters that really made an impression on me. I found that their thoughts, feelings, and actions (even the questionable ones) were extremely believable -- I "bought" these people and cared about them. Furthermore, I found the way that Sean's character evolved throughout the story to be ideal. He did a lot of soul searching and was willing to face his weaknesses head on (eventually), and because of this, he became a better man. As I finished this novel, I just felt happy! One tidbit that I found interesting is that the setting for THE SHORTEST WAY HOME is Belham, Massachusetts -- the same setting for Ms. Fay's SHELTER ME. I adored SHELTER ME and was so happy to see some of the beloved characters make small appearances in this novel. Plus it was a little interesting to see how their lives were going. This won't matter at all for those of you who haven't read SHELTER ME, but if you have, it's a nice little touch! I think many book clubs would enjoy discussing THE SHORTEST WAY HOME because they are so many universal themes. I have a feeling that every reader will find at least one character or situation to which they can relate. I was happy to find that there is a reading guide with twelve thought-provoking questions although I'm not entirely sure you'd need one to stimulate discussion. Some of the topics you might want to further explore include family, obligations, guilt, trust, loss, fear, parent/child relationships, motivations, and love. 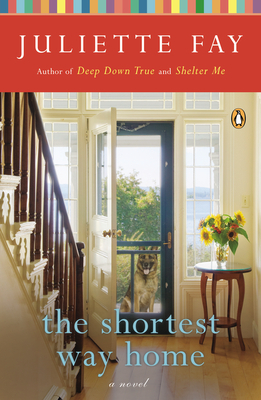 I thoroughly enjoyed THE SHORTEST WAY HOME and I think fans of Ms. Fay's work will too. Highly recommended for fans of women's literature and family dramas. Thanks to Kathy and FSB for providing copies of this book. I've read a book by this author and this one sounds like my kind of book. Great review. When I went to Fay's event, I discovered a lot of people love her characters - they talked about them like they're people they know. This sounds so good! You're always so good about pointing us to the reading guides! I've never read any of Fay's books but based on your review I think it's time I started. I'm putting the Shortest Way Home on my TBR list. Thanks! I started this book but didn't get very far because I got busy with the holidays. I need to pick it up again.